- To an even larger extent, agricultural land is being overgrown, which leads to decreasing food self-sufficiency. Land use as an indicator describes the state of the landscape and the management of land as a basic natural resource. Land use is a result of natural conditions and historical developments. Over the past decades, however, it has mostly reflected socio-economic development, spatial management and administrative procedures. Industrialisation and changes in urban development and transport infrastructure are reflected in increasing land areas used for the purposes of these sectors. 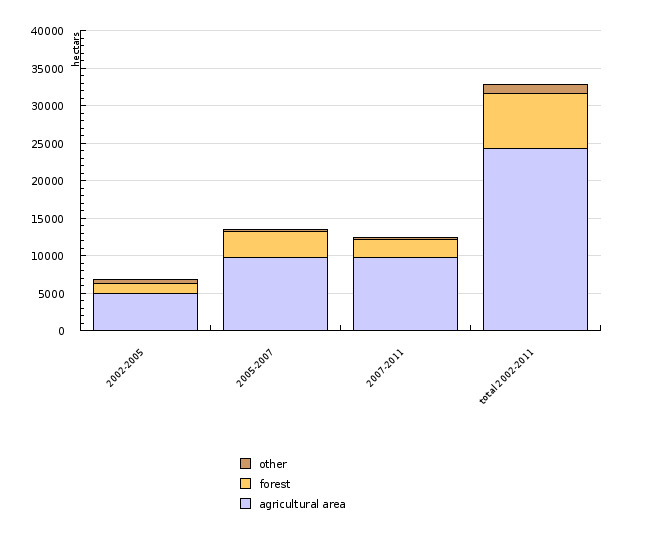 Land use change is shown as a change of category (in 2002 and 2011) in the land use database kept by the Ministry of Agriculture, Forestry and Food. 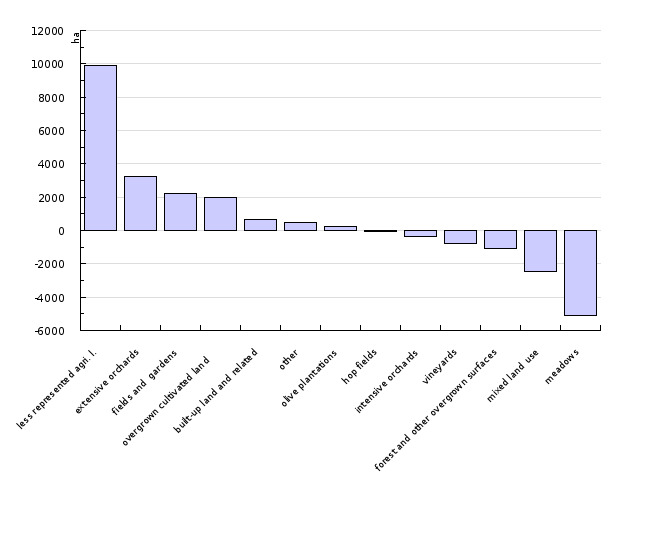 In addition to basic categories, an analysis of urbanisation of land (i.e. land converted from other categories to built-up land and similar categories) has also been conducted. This indicator shows the quality of soil degraded by urbanisation. Soil degradation is defined as a reduction of the capability to perform at least one essential soil function (fertility and circulation of nutrients, filtering/cleaning of surface and meteoric water, sequestration and transformation of pollutants, capture and storage of atmospheric CO2). Soil quality is a combined indicator presenting an essential characteristic of soil that enables the formation and existence of terrestrial ecosystem fertility. Soil quality is defined by the soil productivity index (PI) and is expressed in points between 1 (worst) and 100 (best). PI points are based on the assessment of essential agricultural and environmental soil quality indicators. In addition to fertility, they indicate the capability of soil to perform important environmental functions. Soil is the result of natural and historic conditions, socio-economic development and spatial planning as a set of administrative procedures. The goal of spatial planning is to maintain and shape the cultural landscape, while simultaneously ensuring the sustainable management of natural resources (soil, waters and mineral raw products) and enabling sustainable economic development. Soil is an important natural resource supporting terrestrial ecosystems. Any land with fertile soil in combination with a favourable climate, or simply fertile soil on its own, is a valuable natural resource. Soil is essential to human survival and, consequently, for the development of industry, art and culture. In the past, soil has primarily been assessed through its function in food (in agriculture) or biomass (forestry) production. In addition, soil performs essential ecological functions in ecosystems (e.g. filtering of water, replenishment of groundwater, decomposition/neutralisation of harmful pollutants from transport and industry, sequestration and circulation of CO2, circulation of matter/nutrients and energy). The importance of soil and its function in the environment is communicated in several national and EU documents, along with calls for soil protection. 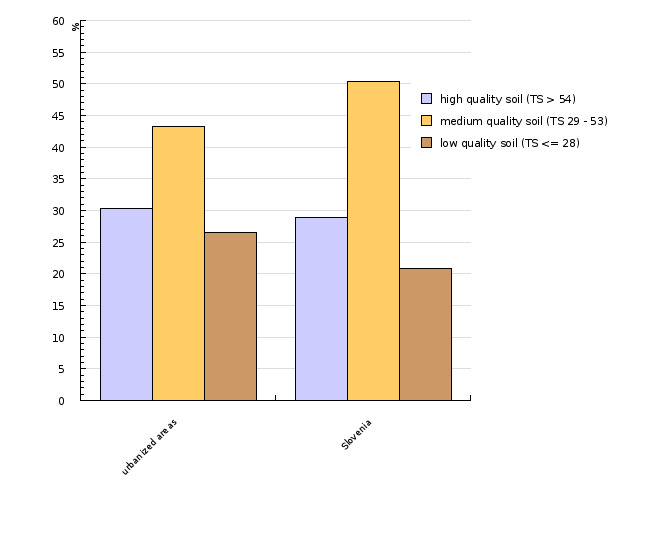 Compared to other soils of lower quality (e.g. shallow and skeletal soils), soils on agricultural land are capable of performing important ecological functions, in addition to enabling food production, due to their complexity and multi-functionality. 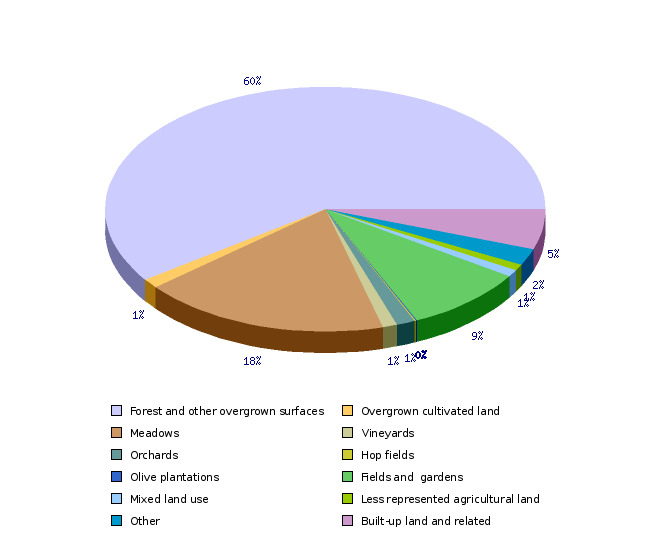 The data from the land use database of the Ministry of Agriculture, Forestry and Food show that in the period 2002–2011, the categories whose area was reduced the most were as follows: arable fields and gardens (15.7%), hop gardens (16.6%), land reverting to natural vegetation (7.3%), vineyards (12.1%) and other uses (17.8%). The total area of forests increased by 0.9%, olive groves by 40.2%, meadows by 7.3% and all types of orchards by 2%. The areas categorised as sealed and similar land covered 5.3% of the territory of Slovenia in 2011. The analysis of land use change shows that 19,712 hectares were converted from other categories to sealed and similar categories of land in the period 2002–2007, which represents a 22.5% increase in the area of urbanised land. In the period 2007–2011, the area of urbanised land increased by 372 hectares. The land most exposed to urbanisation was agricultural (65%) and forest land (24.4%). In Slovenia, urbanisation is a very dispersed process. Greater land use changes are taking place primarily on the outer edge of settlements (for the purposes of industry and trade) and along larger infrastructure facilities (motorways). An important amount of surface area is taken up by the combined areas of small but numerous and the very dispersed construction, renovation, expansion and modernisation of individual buildings and smaller infrastructure facilities. Only large continuous forest areas can be characterised as not having been exposed to greater or numerous land use changes. Urbanisation has mostly been taking place on land with high soil quality. Soil quality is defined by the soil productivity index (PI), as expressed in points between 1 (worst) and 100 (best). In Slovenia, around half of the land area has soil of medium quality (PI 29–53), while higher quality soil can be found on 29% of the land area. However, 43% of the land that was urbanised in the period 2002–2007 had top-quality soil, while 36% had medium quality soil. - non-economical and non-sustainable land use from the perspective of agriculture and the environment and degradation of the natural resource: intensive building/development on ecologically highly valuable land. This process is primarily taking place at the bottoms of valleys, along main transport corridors and around settlements for the purposes of trade, industry and housing. - continued overgrowing of agricultural land. This process is most intensive in mountainous areas with unfavourable terrain and low quality soil. - continued degradation of the cultural landscape that was created over the course of centuries and is a consequence of non-sustainable use of natural resources. The typical pattern of varied land use in Slovenia (interspersed fields, meadows, forests and other types of [semi] natural landscape) is disappearing due to overgrowing and intensive/dispersed building and development. It is estimated that, as a consequence of this land degradation, Slovenia is losing its typical landscape identity. Urbanisation is the expansion of urban areas on neighbouring areas with agricultural or (semi) natural land use. It comprises a whole spectrum of impacts on the soil (complete sealing, mixing, compaction, pollution) that reduce its capability to perform agricultural and ecological functions, affects circulation of matter and energy in the environment and, therefore, represents a health risk. Overgrowing or reverting of agricultural land to forests does not represent an irreversible degradation, as it is a reversed process of land use change. Strictly ecologically speaking, it can be characterised as a positive trend. However, when seen as a whole, it is estimated as a negative trend of spatial development in Slovenia. Slovenia is ranked among the most forested European countries. Further intensive overgrowing of agricultural land by forest is a negative process, as it causes disintegration of the cultural landscape and impoverishment of diverse semi-natural habitats. Land use change is reversible and does not significantly affect the quality or quantitative decline of soil resources. Reversing the change from various agricultural as well as overgrowing or even forest land is possible. Urbanisation is a negative trend because it causes irreversible destruction of a natural resource, at least for the period of human civilisation. As Slovenia is a country with modest natural resources, the extent of urbanisation in the last decade raises concern, particularly because it is mostly taking place on high quality agricultural land. Land take can be estimated at approximately 11 hectares per day, which is a much higher rate than e.g. in Germany where 90 hectares of land is lost per day, compared to its territory, which is 17.6 times larger than Slovenia's. Considering the fact that Slovenia is mostly mountainous and that there is very little high-quality soil and agricultural land, these numbers cause even greater concern. Urbanisation in Slovenia has a dispersed pattern, which is a consequence of poor spatial management. In addition to degradation of the cultural landscape and landscape identity, reverting of agricultural land to natural vegetation represents the threat of reduction of habitable land. It also causes economic loss, as the conversion of forests back to agricultural land would imply higher costs. Conversion of farmland to forest conditionally implies improvement in the quality of soil strictly from an ecological perspective.